So, I have poison ivy. AGAIN. If anyone is keeping track, that brings my count to, I think, five times this in the last few months. Given that it usually takes a few weeks to go away, that means I’ve basically had poison ivy to some degree ALL SUMMER. Instead, I did what any good millennial will do when in need of solutions to a problem. 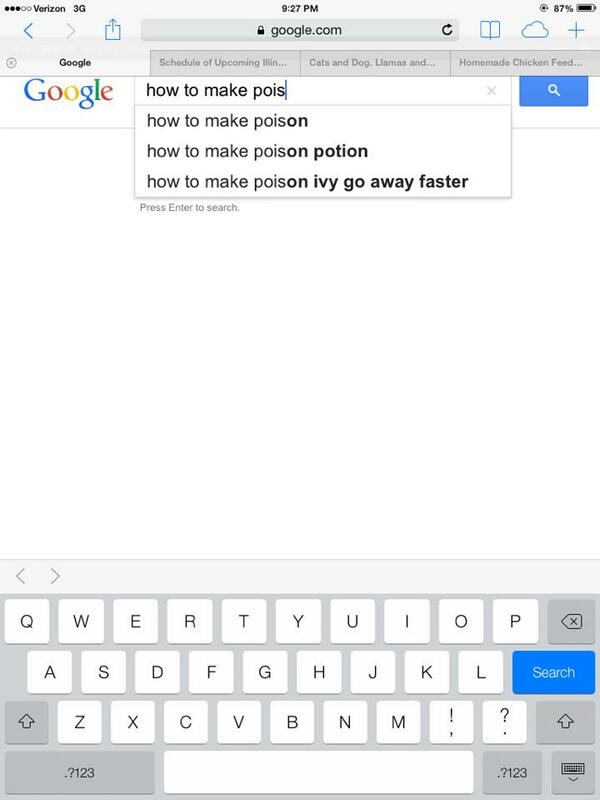 Turns out, Google’s first impulse is to assume that I’m trying to make poison. (To what ends, Google apparently does not judge.) It’s second impulse is to assume I’m a medieval sorcerer in search of potion making tips and tricks. (You have to go with sorcerer, by the way, because witch is just loaded with gender biased connotations. You probably don’t have to assume it’s medieval, but I did because I like the word medieval.) It is not until Google’s third impulse that we get anywhere near where we need to be. You know what this means, don’t you? It means that there are more people out there searching for ways to make poison…or, erm, poison potions…than there are innocent people like me who just want to make poison ivy go away. Once I got passed my initial searching, which took a while because of the running commentary I was providing for my husband who really trying hard to get some legal documents filed with legal zoom, I finally found a fairly useful article on WebMD. And by fairly useful, I mean that it provided quality information without suggesting that my poison ivy might be cancer. 2. Use a baking soda paste on the affected area. 3. Use watered down vinegar. Now, these suggestions are all meant to be used individually, but, being the overachiever that I am, I decided to try all of them at once. Go back and read that list again. Do you have it yet? I’m not even kidding. Within about 10 minutes, the poison ivy rash that had been tormenting me all day stopped itching. And the itching hasn’t come back. Because science. Now, if only I could come up with a delivery method that INCLUDED the 3rd grade volcano, this would perhaps be the best discovery ever. Previous The one where we moved in and then moved back out again…in less than a week. Next A week at the ranch. As a fellow sufferer of regular poison ivy attacks – thanks to my two Westie boys – I will try this concoction of baking soda and vinegar next time. It is AGONY. Last time I got it? Just before our family reunion in Maine….all over my face. Lovely. Hope you remain rash-free for the rest of the year. Thanks a bunch. You know, I can’t promise anything, but it cured mine within ten minutes or so. Just remember the ice pack. I’m pretty sure that might be important. Also, for the record, I’ve had it on my face before too. That is literally the worst. … Except, now that I think about it, my uncle apparently once got it on a far more private area. That was probably the actual, literal worst. This is such a fun read especially as I am one who is highly allergic to poison ivy so I was drawn to it from the very beginning but you have such a great story telling style that I was quickly caught up in it, well done and I will keep your remedies in mind the next time I get poison ivy and it will be soon. Awe. Thank you. And yes, totally try this. It’s the first thing, other than prescription meds, that I’ve found to work! My LOL ROFL LMAO. BTW, I like the sound of medieval too. Guess what? You just past the test to be a journeywoman wizard. Congrats. It means you can now practice basic wizardry. But be careful. When you try to levitate the dishes into the dishwasher, sometimes they head for you instead of the dishwasher. So make sure you know how to duck. Those darn things hurt. You have a gift now. Use it responsibly. Last resort remedies sometimes surprisingly work. Vinegar/baking soda work also for removing stains on carpet and counter tops. Another concoction for your first aid kit. You remind me of me a bit. Once I had a tiny sore that just wouldn’t go away. Should have done what you did and Googled to find out how to make poison. Not me! I made a poultice of garlic, put it in gauze and strapped it to my arm. It burned and I thought that was good, so I left it on all night. The next day, I woke up to a two inch round blister and have the scar to prove it. That was many years ago. Next time, I think I’ll Google it.